The Blackwell-Wielandy Building was a seven-story brick commercial warehouse located on the northwest corner of 16th and Locust Streets just west of St. Louis’ Central Business District. Designed by St. Louis architect Albert B. Groves, the building has been the home of two of the city’s leading book and stationery firms since its completion in 1907. Measuring 90 feet by 155 feet, the building extends five large bays on Locust and St. Charles and sixteen bays on 16th Street. A two-story base is established by speckled grey brick piers which carry the red brick superstructure. Greyish-white terra cotta ornament is employed for the belt course and cornice on all three elevations and is used to richly embellish the pier capitals, storefront lintels, and central entrance of the Locust Street elevation. The decorative grillwork in the Locust Street doorway and the balustrade above it are fashioned out of metal. Large Chicago-style windows articulate the principal (south) elevation and are used to mark the first and last bays of the east elevation; all three components of these windows have movable wooden sash as do the smaller windows above the first story on the east elevation. The first story of the rear (north) elevation is divided into four loading docks and an entrance located at the west end of the building; the eastern loading dock and windows above are bricked-in with what appears to be the original construction brick. Exploiting the interruption of 16th Street at St. Charles Street, the western two bays of the rear elevation are formally articulated with an imposing two-story red terra cotta entrance detailed with Renaissance motifs; the pairs of windows above are also trimmed with red terra cotta lintels. The interior of the building employs straightforward mill construction with no other architecturally significant features. The only noteworthy alteration has been the removal of part of the cornice on the front (south) elevation. Designed in 1907 by St. Louis architect Albert B. Groves, the seven story brick building is an interesting example of a transitional St. Louis warehouse which combines functional form in the austere geometric refinement of Chicago-style windows with rich historical ornament incorporated into both the front and rear elevations. The building survives virtually unaltered with the exception of the partial loss of the cornice on the front elevation. Effects of St. Louis’ rise in national rank to the fourth largest manufacturing city in the country were evident in the rapid westward expansion of the Central Business District at the turn of the century. A milestone of progress was marked in 1899 with the construction of a large warehouse building at 13th and Washington which forged across the barrier of 12th Street, long the outer limits for business property. Six years later a local syndicate’s record-breaking purchase of over 1,200 front feet on Washington Avenue between 13th and 18th Street signaled a new era of growth for St. Louis’ wholesale district. At this time speculation was also widely circulating that Locust Street, another major east/west thoroughfare, would be the “scene of the next big land deal” between 14th and 18th Streets. Locust Street, it was claimed, was destined to become a rival of Olive Street as a retail center and of Washington Avenue as the hub of the city’s wholesale trade. Announcement of plans to clear the site of the city’s Exposition Hall which had blocked Locust Street between 13th and 14th Streets since its construction in 1884 further enhanced the street’s potential for westward development. In November 1906, the accelerating real estate activity On Locust Street was boosted by a report that a new wholesale building was planned for the northwest corner of Locust and 16th Streets. Constructed for the John L. Boland Book & Stationery Company, the building was promoted and financed by 17th Street Realty Co., a newly incorporated firm whose name aptly dramatized its goals of expansion. Designed by Albert B. Groves (1866–1925), 1601-09 Locust Street was in keeping with the monumental spirit already established for commercial warehouses along the corridors of the wholesale district. Employing functionalist principles in the horizontally proportioned Chicago-style windows, the principal (south) elevation, Groves relied on a classical tradition to impart formal interest and artistic effects to the whole. The rich baroque treatment of the Locust Street entrance and the unusual attention lavished on the formal articulation of the rear (St. Charles Street) entrance are distinguishing features of the building which set it apart from similar building types in the wholesale district. Also noteworthy is the use of stylized geometric ornament projecting above the cornice line on the Locust Street facade. Working principally in a “modern” Renaissance commercial style, Groves became the foremost designer of other warehouse buildings which filled the western leg of Locust Street and Washington Avenue by the 1920s. Long associated with Brown Shoe Company, Groves achieved recognition for his 1906 Renaissance design for Brown’s general offices on Washington Avenue and 17th Street (razed) and for his expertise in factory design published in the American Architect in 1918 and given form in eleven shoe factories. Known locally for the versatility of his portfolio, the Cornell-trained architect received prestigious commissions for eighteen churches and numerous large houses in St. Louis private places in addition to his commercial work. Groves’ important designs outside Missouri include the First National Bank Building and the Taliaferro house in Tampa, Florida, and buildings in Denver, New York, and Oklahoma. Completed in 1907, the building was probably built to specifications for the John L. Boland Book & Stationery Company, the first lessee. Located in the 600 block of Washington Avenue since the 1880s, the Boland firm’s move to 1601-09 Locust Street followed the turn-of-the-century trend of westward migration to new modern business and manufacturing buildings beyond 12th Street. Virginia-born Boland (1840-1905), son of a prosperous Condederate plantation owner, had come to St. Louis in 1866 after the devastation of family holdings during the Civil War. Within four years he was made a partner in a wholesale book and stationery firm, Cantwell, Shorb & Company, which by 1875 had evolved to Shorb & Boland and was owned entirely by Boland in 1884. Under Boland’s management, the relatively small local business of Shorb & Boland was expanded into the Western states and Indian territories formerly supplied by Eastern firms. By the end of the nineteenth century, the St. Louis stationer numbered among the largest houses in the country. In 1910, the Boland company was acquired by the Blackwell-Wielandy Book & Stationery Company which moved into the 16th and Locust building from their headquarters at 714-20 Washington Avenue. One of the founders of Blackwell-Wielandy, St. Louisan Paul J. Wielandy, formerly had been employed for twenty years as a salesman for Boland. During his pioneering years as Boland’s representative in the Southwest, Wielandy met Missouri-born Arthur M. Blackwell who by then, was a successful merchant and bank director in New Mexico. In 1901, the two men returned to St. Louis where they established the firm bearing their names. Among the innovative new products first manufactured by Blackwell-Wielandy around 1912 were an adjustable ring device for loose leaf notebooks and the Blue Jay writing tablet—both popular items with the school trade. The Blue Jay brand was later extended to other supplies such as ink, crayons, paste and composition and notebooks. By 1921 Blackwell-Wielandy employed four hundred persons, and annual sales had reached over four million dollars. The company’s increased size had required the construction in 1919 of a seven-story warehouse on the adjacent lot to the west of the original 1907 building. Their showrooms featuring books, stationery, and holiday goods for children were established in fourteen cities across the country. The company had taken an active role in founding the Wholesale Stationer’s Association in New York in 1916 when Eugene Pettus of Blackwell-Wielandy was elected the first President of the group. In 1927, it was reported that Blackwell-Wielandy was the largest house of its kind in the country; in addition to manufacturing various lines of office and school supplies, the firm also was involved in commercial printing and book binding. Beginning in the 1930s the dispersal of light manufacturing to outlying areas in Missouri and Illinois gradually undermined the position Locust Street and Washington Avenue once held as a thriving wholesale center of the city. 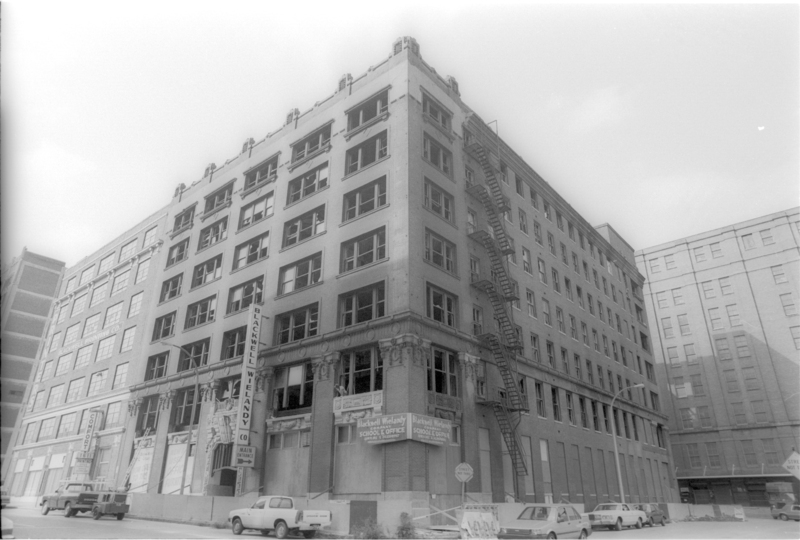 Although the 1950s and 1960s witnessed the collapse of an increasing number of firms, Blackwell-Wielandy continued operations in their 16th and Locust building until 1982.